They just don’t make rappers like they used to. 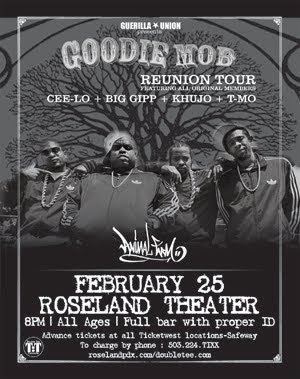 Reunited and rearing, the original members of Goodie Mob treated Portland to a night of classic Dirty South jams, rock’n'roll samples, and raw spitting–a night without auto-tune, without theatrics, without nonsense–just four MCs and one DJ. Taking it back to 1995, when Goodie Mob coined the now-ubiquitous term “Dirty South” with a cut off their debut album Soul Food, each member fit back together like the spices in the Colonel’s special recipe from tangy to syrupy, biting to comical.